While it is difficult to be overly engaged with high school students on a Sunday morning right before they head back to school after a Christmas break that has threatened to turn their brains into mush, it was a great opportunity to reflect on the Eucharist. 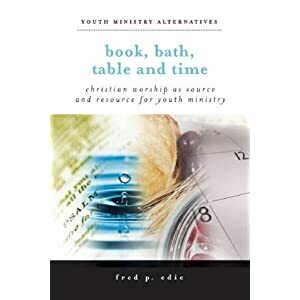 My prayer has been, as with other volunteers, that as we continue to do life and community with youth in the church that the sacred and sending table and the sacred and sending waters of baptism would be reclaimed as central to all we do as youth pastors and ministries. They want it. They need it. They love it. They crave it. Even more, it reminds them that they are a part of something so much bigger, far more beautiful, and certainly more life giving than the consumer driven products and packaged materials that have become the life and breath of contemporary youth minsitry. We think that is what they want. However, in such poor assumptions we have underestimated the hearts, minds, and callings of today's youth and their ability to engage the rich tradition they are a part of and the sacred symbols that invite them to be God's people in and for the world. I spent the morning reading your blog posts. I didn't comment on all of them, but will return again and again. I appreciate the information you give us, as well as resources. Thank you, Greg!